Yesterday I introduced the Story Starters Web app to our class on the Smartboard. 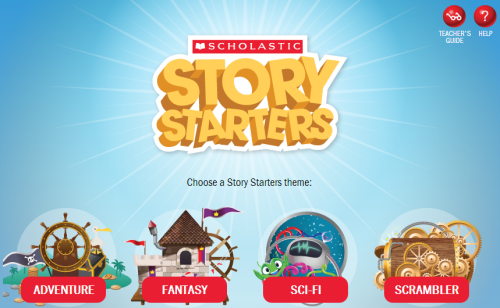 Story Starters generates writing ideas in a fun engaging way. After we generated several writing ideas, students used the story starter as a spark for some creative writing. Tell a make-believe story about a busy innkeeper who travels on a river in a peanut shell. Write a bedtime story about a pretty fairy who must return to the sea. Draw a picture of and write one sentence about a tired troll who meets the new queen. Make up two questions to ask a noisy ogre who tricks a talking cat. Write about finding a surprised fox who is lost in a magical forest. Tell a make-believe story about a jolly bee who has a picnic in a hot air balloon. Creative Writing from Patrick Johnson on Vimeo.